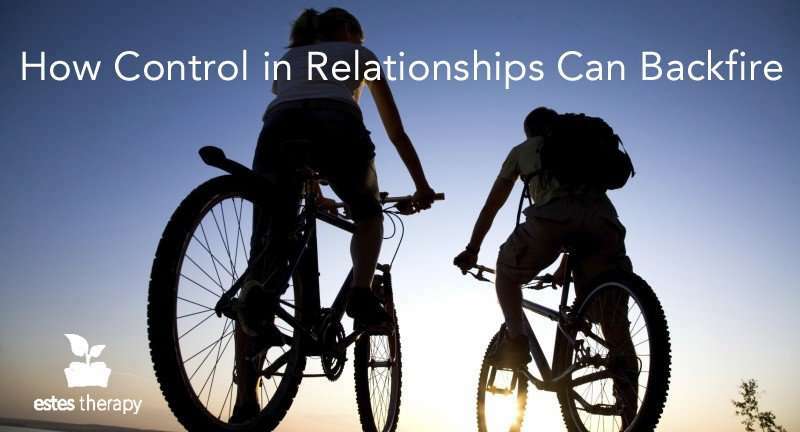 You will be shocked by what I learned about control in relationships while mountain biking. Several summers ago my partner and I went to a local ski resort (yes, in the summer) with a plan to take the lifts up to the top, and then ride down the trails on our mountain bikes. It was a beautiful vista, with a bright clear sky, wind blowing at our face, and nature surrounding us. It was a beautiful day. I was pushed to my limit by riding my mountain bike down steep, narrow and rocky trails. I was terrified. I was afraid of getting hurt, so I tried my best to control the bike and the speed. The faster I went, the more fear I felt, and the more I tried to control the speed. The more speed, the more I wanted to use the brakes. Well, the more breaking you do going down a steep mountain with rocks, the more dangerous it becomes. I learned quickly: the more breaking, the more the bike seemed out of control. This story illustrates a common theme I see in relationships: The more we try to control uncomfortable situations, the more dangerous they become. When we get worried or afraid of being hurt, we often then try to control the situation. The reality is that attempting to control something or someone usually causes a reactive response, the opposite of what we are expecting. The more I tried to be in control going down the mountain, the worse I put myself in danger of getting hurt. However, once I relaxed, maintained my momentum, and let the bike do it’s thing, the smoother the ride became, and likewise, the safer I became. Weird, huh? Attempts at over-controlling a relationship or a personal goal can take many forms. For example the more we try to control our weight, the harder it becomes to lose weight. The more we try to get our partner to take out the garbage when it becomes full, the longer it will sit there. The more we try to get our partner to stop drinking, the more he drinks. The more you tell me to eat chocolate cake every day, the more I will refuse (even though I love chocolate cake). Relationships require guidance, not control. Let the relationship take its course. Influence the relationship, guide it where you want it to go and have a voice, but avoid trying to over-control by telling your partner how, when and what they need to do. Control in relationships adds stress; stress induces a fight, flight, or freeze response — not exactly productive during conflict. In my couple’s therapy sessions, I frequently run into the issue of control in relationships. Another pattern I see is that no matter how much control and hurt that goes on, couples continue to repeat the same behavior. Learn how to break the cycle and let go of controlling the relationship. Relationships should be easy, not a challenge. Don’t try to control the speed, simply be there and learn how to influence your partner in a positive way and guide the relationship down the rocky mountain. Remember why you decided to have the experience, and remember to relax and enjoy the view. If you are having problems with control in relationships, couples counseling could help you learn more productive ways to influence your relationship in a better direction.